Perioral dermatitis is a common inflammatory rash that occurs around the mouth area. Other affected areas include around the nose, chin and eyes. Perioral dermatitis affects women more than men and is frequently associated with topical steroid medication usage. Fortunately, perioral dermatitis is responsive to treatment and recurrence is rare. Inappropriately potent or lengthy topical corticosteroid usage on the face. Common examples include mometasone furoate, betamethasone diproprionate, betamethasone valerate and triamcinolone. The use of heavy cosmetics, make-up and moisturisers, sunscreens or antifungal creams on the face. The use of cosmeceuticals including face creams, toners and scrubs. Other initiating factors include corticosteroid eye drops, nasal sprays or “preventer” asthma inhalers. 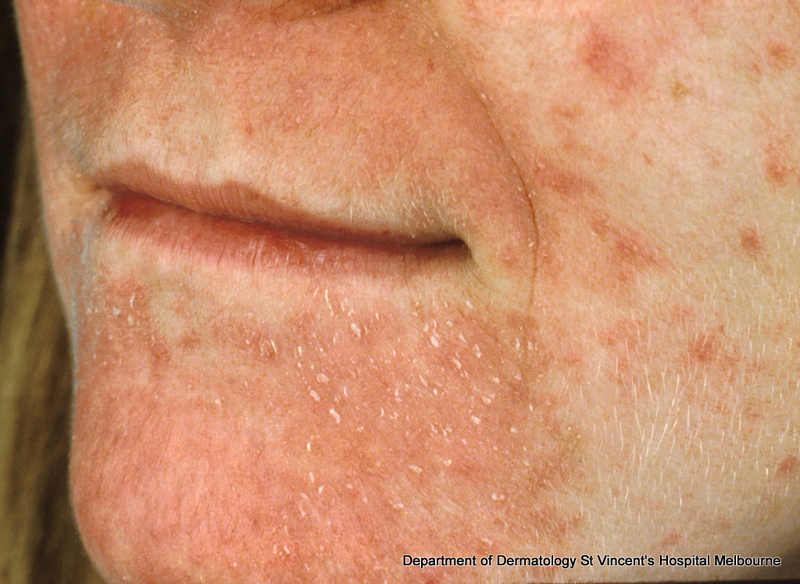 Perioral dermatitis presents as multiple red pimple-like bumps that tend to group around the mouth, nose and chin. The skin around the eyes is occasionally affected. If the lip area is affected, the lip line is classically spared. The overlying skin may be red, dry and flaky. This condition is more common in women than men. Children can also be affected. Perioral dermatitis may be symptomless however burning, tightness and itchiness are common. 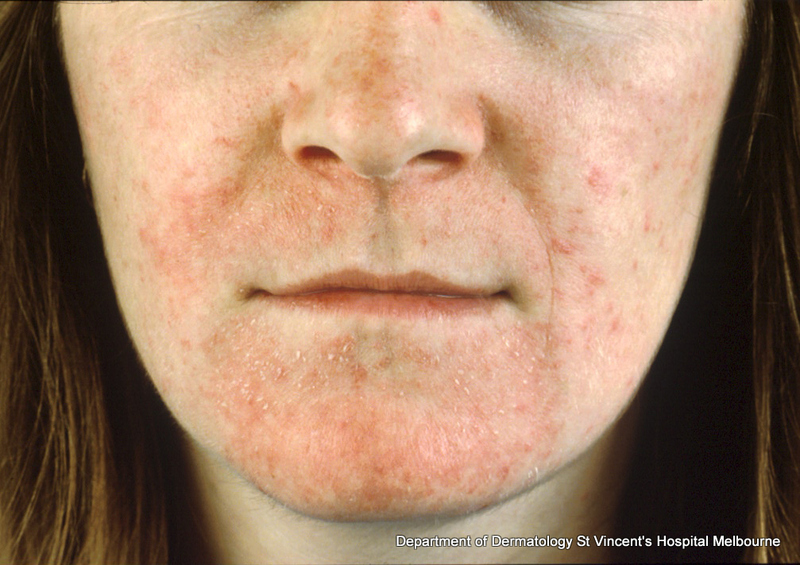 Perioral dermatitis frequently starts off from an unrelated rash or skin irritation. Topical creams, most often corticosteroid and over the counter preparations, are then used. This leads to an outbreak of perioral dermatitis which then seems to be less red with further steroid usage. Ceasing topical steroids generally leads to a flare-up which then encourages further steroid use. Hence a vicious cycle of steroid use is set up. No tests are usually necessary. Most cases of perioral dermatitis can be diagnosed from a history and examination. In resistant cases, allergic contact dermatitis should be considered and investigated through targeted patch testing. Consider specialist referral. If steroid cream use is suspected, stop using the cream altogether. A rebound or flare-up of perioral dermatitis is to be expected after you stop using the cream, however do not be tempted to re-use the steroid cream again. If steroid nasal sprays or inhalers are suspected, try rinsing the face and mouth after use. Simplify all skin care. Use soap substitutes and gentle skin care products. If possible, keep make-up use to a minimum. Oral antibiotics are the most effective treatment. They are effective through anti-inflammatory mechanisms and not through their anti-microbial actions. Usually a 6 week course is prescribed. An additional 6 week course may be considered if the rash recurs. Tetracycline and macrolide antibiotics are most frequently used, including doxycycline, minocycline and erythromycin (the only option in children whose teeth have not formed). Topical medications are not as effective as oral medications. Examples include erythromycin, clindamycin, metronidazole and azelaic acid. These may be preferred in pregnancy. Topical pimecrolimus has also been used however this medication has occasionally been reported to be the trigger for perioral dermatitis and should be used with caution. Erythromycin suspension for 4 to 8 weeks is recommended in the treatment of children under the age of 8. What is the likely outcome of perioral dermatitis? Perioral dermatitis carries an excellent prognosis and recurrences are rare providing initiating factors are avoided. 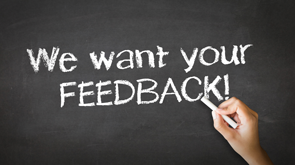 Most individuals will start to improve within a few weeks of treatment. If perioral dermatitis recurs, a further 6 week course of antibiotics is recommended. The use of a simplified skin care regime, coupled with avoidance of topical corticosteroids and heavy make-up can prevent recurrences. Consider referral to a dermatologist for resistant cases. Prevention, by avoiding strong topical corticosteroids on the face, is the best option.